Most groin strains can be diagnosed with a physical exam. Images may be needed if severe damage is suspected. Images may be taken with an MRI scan . Muscle strains in the thigh. Ortho Info—American Academy of Orthopaedic Surgeons website. Available at: http://orthoinfo.aaos.org/topic.cfm?topic=A00366. Updated March 2014. Accessed February 23, 2018. 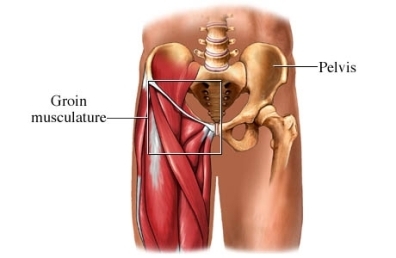 Sports-related groin pain. EBSCO DynaMed Plus website. Available at: http://www.dynamed.com/topics/dmp~AN~T115701/Sports-related-groin-pain . Updated March 2, 2017. Accessed February 23, 2018. 10/26/2010 DynaMed Plus Systematic Literature Surveillance http://www.dynamed.com/topics/dmp~AN~T115701/Sports-related-groin-pain : Massey T, Derry S, Moore R, McQuay H. Topical NSAIDs for acute pain in adults. Cochrane Database Syst Rev. 2010;(6):CD007402.